Get Stronger, Longer and Leaner with Pilates! Developed by Joseph H. Pilates in the 1920’s, Pilates is a system of exercise that targets the deep muscles of the abdomen and spine to strengthen your body from the inside out! Watch this video to quickly learn the history of the amazing Pilates system. by infobytes.Browse more data visualization. Instead of just working on the “vanity muscles” – the muscles you see in the mirror – Pilates strengthens the “postural muscles” – the internal, stabilizing muscles of your body – so that your posture, balance and core strength all improve WHILE you sculpt the body of your dreams! Which is better, Privates or Classes? for every dollar spent and them redeem points for free goods and services. Most know of Mat Pilates or Reformer Pilates, but Joseph Pilates invented many pieces of equipment. 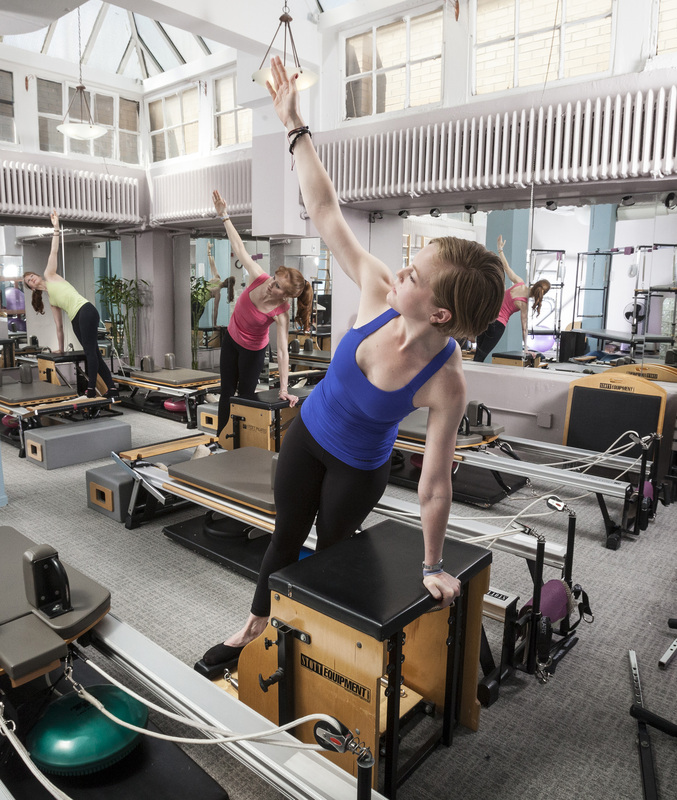 Pilates on Fifth features six of Joseph Pilates' unique Pilates equipment. Let us introduce you to the Pilates equipment. While common knowledge to the most devout Pilates enthusiasts, most Pilates practioners don't know that the Pilates Reformer was originally created soley as a modality for rehabilitation. The anti-gravity nature of the exercises naturally lends itself to post-rehabilitation, as alignment can be restored without having to combat the effects of gravity. Moreover, the Pilates Universal Reformer, with its pulleys and spring resistance, offers a wonderful balance of training for both strength and flexibility. Spring resistance can be adjusted to accommodate unique goals, strengths, and fitness levels. Strength will never be sacrificed for flexibilty, and flexibility will never be sacrificed for strength. Affectionately known as "The Rack", the Cadillac looks INFINITELY much scarier than it is! While it also features spring resistance as does the Pilates Reformer, the Pilates Cadillac divulges even subtle imbalances more quickly. Joseph Pilates named this piece "The Cadillac" because he believed it was "the Cadillac of Exercise Equipment". (This was the 1960's.... now it might be the "Rolls Royce" of exercise equipment!) Additionally, the Pilates Cadillac can actually serve to make certain Mat Pilates Exercises EASIER! YES! Certain Pilates mat exercises can be broken down and made "digestible" with the Cadillac. But of course, with the fitness fanatics out there, the Cadillac can provide some super hard exercises to strengthen you from the inside out, and more. Love it or hate it, the chair will deliver results. Exercises on the chair are designed such that the core is inevitably recruited to either lift or even to stabilize the body. The result: total body muscle recruitment and a satisfying feeling of power and strength. Pilates on Fifth's chairs feature removable handles, allowing exercises to be done standing on the chair without fear. In addition, our chairs feature a split pedal option to further challenge core stability. Because only a portion of your body can fit on the ladder barrel at any time, YOU have to hold the rest of it up, making for VERY intense exercises and workouts. However, for a more gentle approach, stretching on the ladder barrel is absolutely ideal. The smooth surface of the barrel makes stretching both comfortable and dynamic. Pilates Sessions are offered in both private and group class formats.